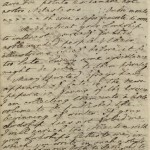 I wrote last Friday’s You’ve Got Mail piece for the Houghton Blog on a major new acquisition–a lengthy 1775 letter from Boswell to his brother David. We acquired a second letter at the same time, which may not be quite as dramatic as the letter to David Boswell, but is important and interesting nonetheless. Boswell was an important advocate for the cause of Corsican independence in the 1760s, and first found literary fame through his book An Account of Corsica. 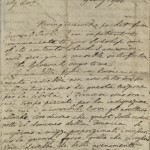 To build British support, Boswell relayed reports from the Corsican leader Pasquale Paoli to persons of influence, in this case George, Lord Lyttleton, a former Chancellor of the Exchequer. Boswell implores Lyttleton to attach his prestige to a book Boswell was preparing called British Essays in Favor of the Brave Corsicans. If your Lordship does not forbid me I will enrich the collection with your Lordship’s letter to me in which you write in such a style as does honour both to Paoli and to your Lordship. Pray do not refuse that such a testimony to the modern Epaminondas should appear at a time when he is in distress. Boswell was unsuccessful on both counts: Lyttleton’s letter did not appear in British Essays, and Paoli’s Corsican revolutionaries were forced to surrender to French rule the following year. 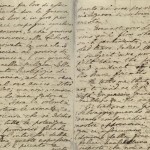 Published in:John Overholt |on June 7th, 2012 |Comments Off on We’ve Got Boswellian Mail!